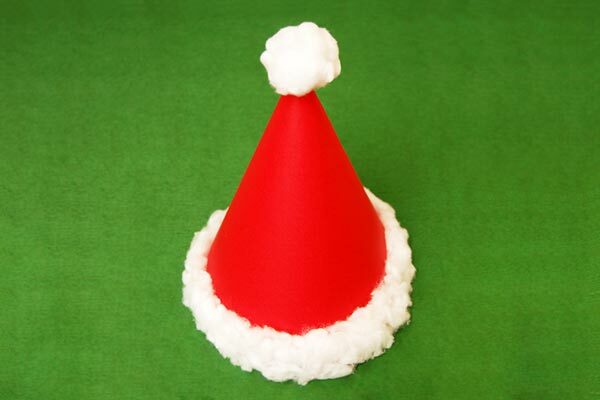 Make your own Santa Claus hat out of felt or fabric. The first step is to make a hat pattern from paper. 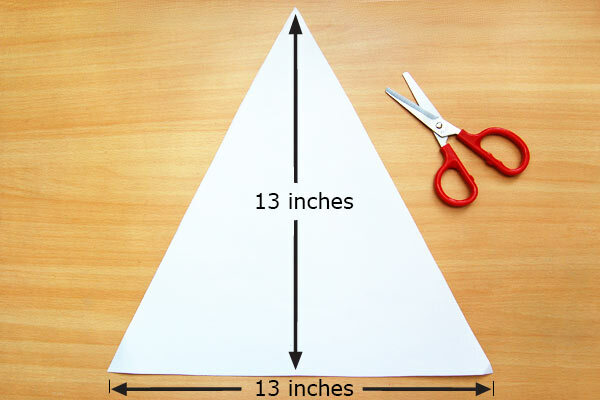 Draw and cut a triangle with a base length and height of 13 inches. 2Tie a pencil to a string. Tape your triangle to a flat work surface. 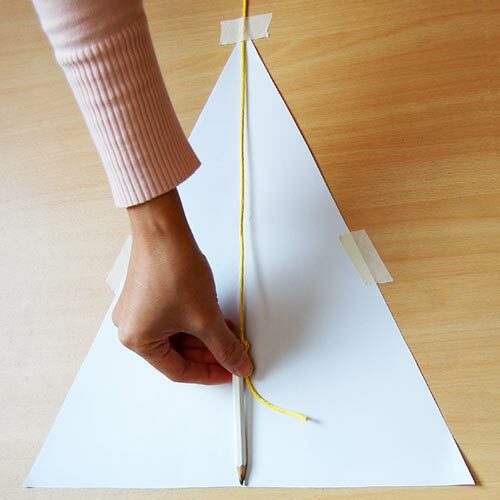 Tie a pencil to a string and stretch the string taut from the apex (or tip) of the triangle until the point of the pencil touches the midpoint of the triangle's base. 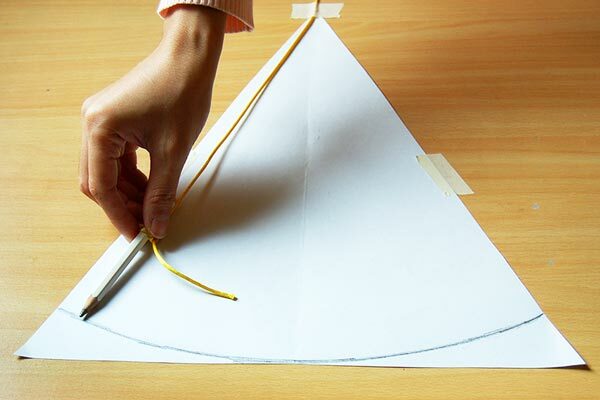 You'll find that it will make the next step much easier if you tape the string to the apex of the triangle as well. While keeping the string taut, draw an arc spanning the two opposite sides of the triangle. Cut the triangle following the arc. The resulting shape looks something like a slice of pie. 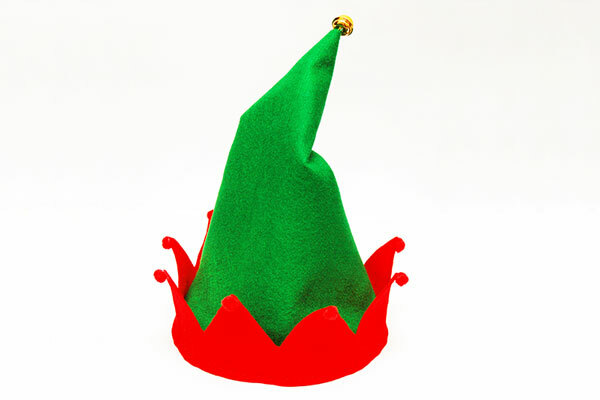 This will be your elf hat pattern. 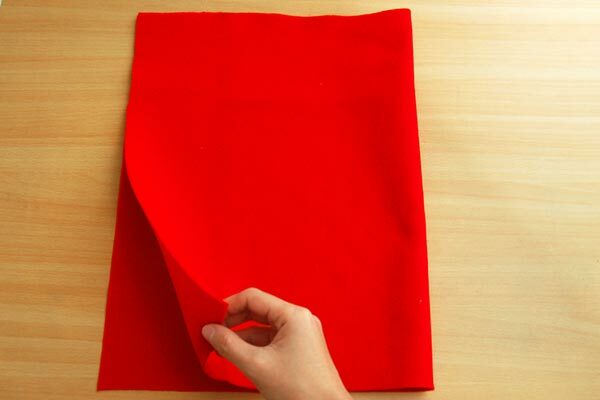 5Prepare a sheet of felt or fabric. 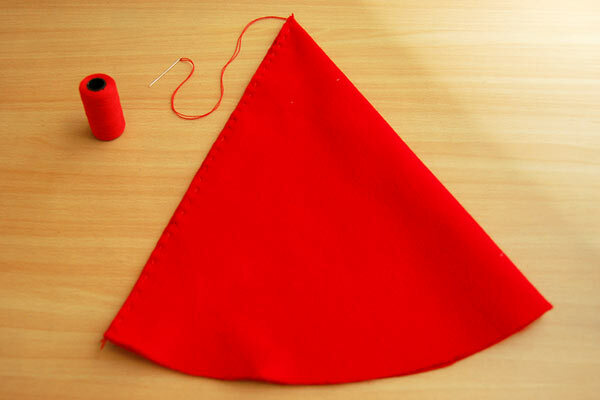 Prepare a large sheet (at least 22 x 14 inches) of red felt. If you want a soft or droopy hat, use thin felt or a soft-type fabric such as velvet. 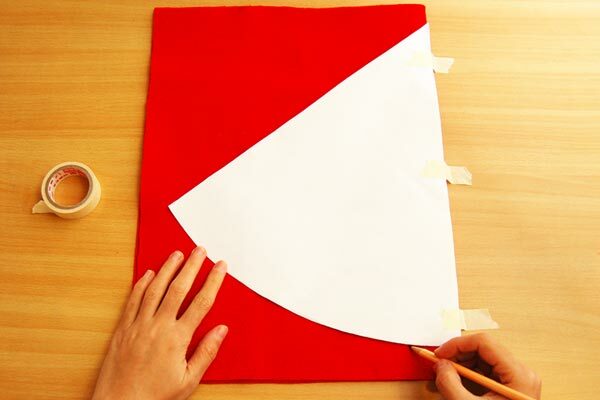 In case you don't have a large enough sheet of felt or fabric, you can use two smaller sheets. Each sheet should be the same size or a little larger than your hat pattern. 6Trace the pattern onto the fabric. Align one side of your hat pattern along the folded edge of the fabric. Tape the pattern in place if you like. Trace the outline of the pattern onto the fabric. 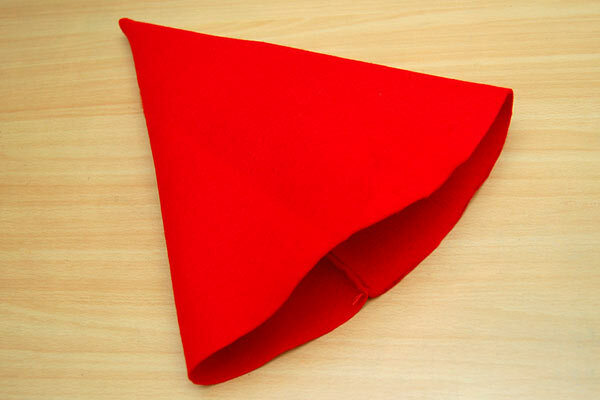 If you are using two smaller felt or fabric sheets, trace the hat pattern onto each sheet. While keeping the fabric folded, cut along the hat outline. 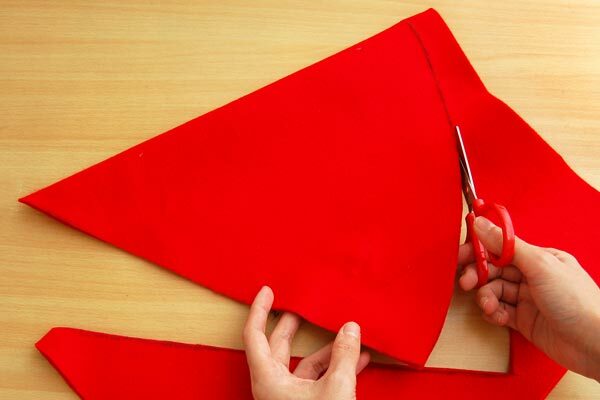 If you are working with two smaller fabric sheets, cut out the hat outline on each sheet. 8Join the straight edges together. Join the straight edges of the folded fabric by stitching them together or by gluing them together with felt glue or low temperature glue gun. 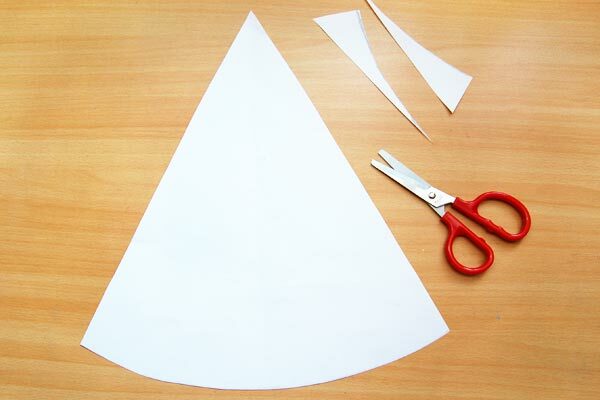 When working with two smaller sheets, stitch or glue the pair of hat cut-outs together along their two straight sides. 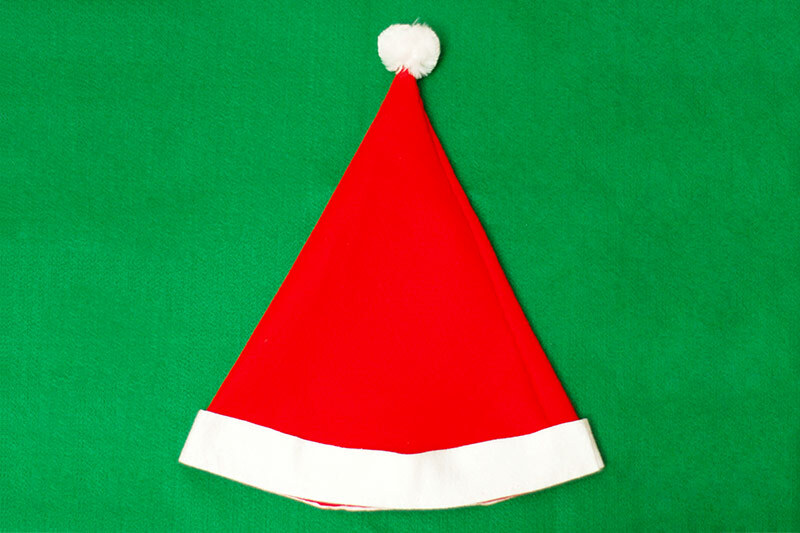 Turn the hat inside-out so that the stitches or the glued edges are concealed inside. You will also notice that you now have a cone-shaped fabric hat. 10Make a white felt band. 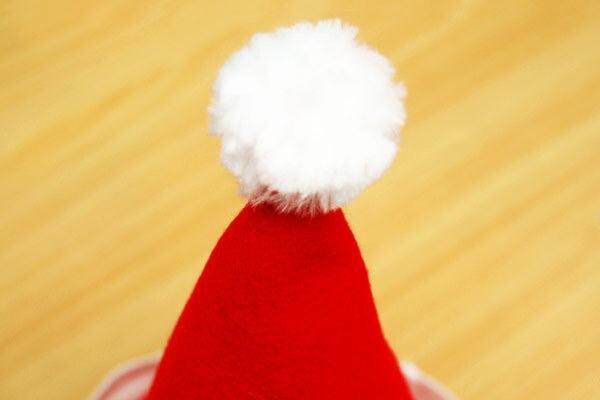 Cut out a 1½" to 2" wide band from white felt or fabric long enough to go around the base of the hat. 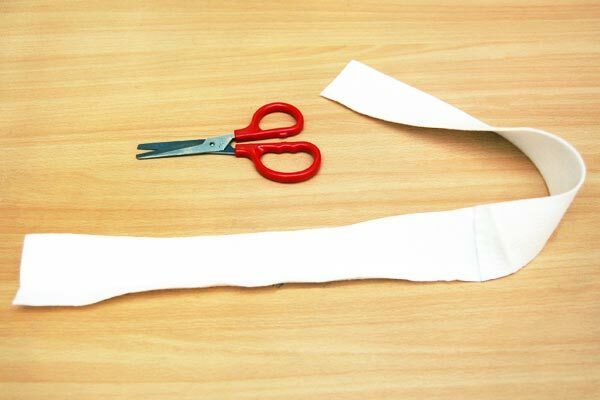 If your felt sheet is not long enough, you can make two shorter strips then glue or stitch them together to make a longer band. 11Attach the band to the hat's base. Stitch or glue the band at the base of the hat. 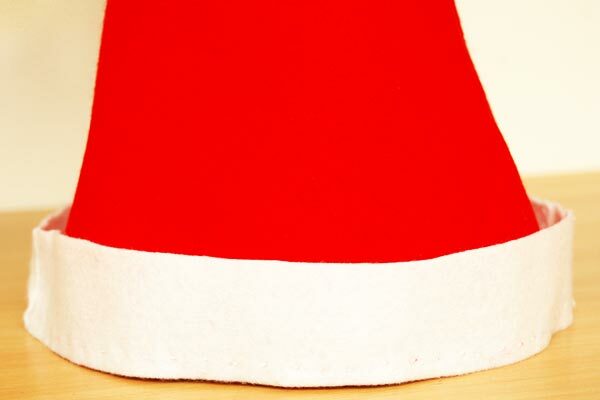 Glue or stitch a big white pompom at the tip of your Santa hat. If you don't have a pompom, you can roll a large chunk of cotton into a ball and glue it as a hot topper. 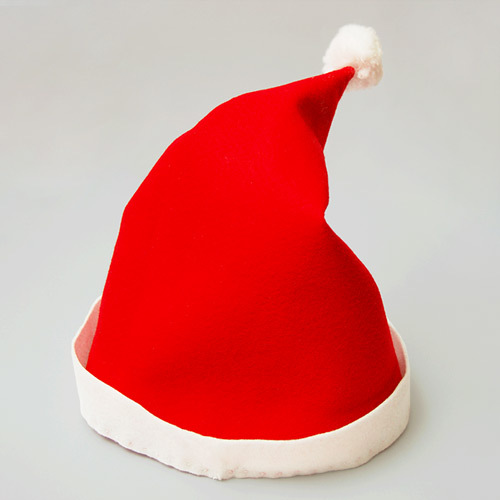 Finally, try on your Santa hat!